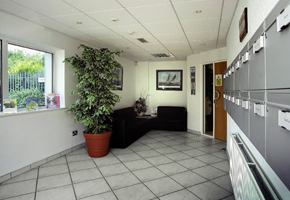 Each of our spacious office suites is fitted with air-conditioning and controllable heating as well as double glazed windows with solar reflective film and window blinds - keeping you comfortable all year round. 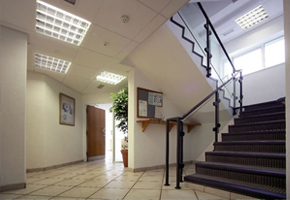 Anti-glare category 2 lighting and high quality soundproofed partitioning are also fitted. We provide for all telecoms and IT systems using standard ISDN telecoms cabling within discrete triple compartment trunking systems providing you with a neat, tidy and safe environment to work in. We also provide for simple set up of ADSL and broadband services. All pre-wired and ready to go, you are free to choose the most suitable, cost effective service provider for your business needs. Eden House Business Centre provides 24 hour access to each suite using individual access codes to allow entry via our security systems. The access control system located in the lobby is connected to each suite, allowing visitors to call your office directly and enabling you to control access. The building is also protected by monitored electronic intruder alarms, sophisticated smoke detection systems with direct emergency services links and a 24 hour CCTV digital recording and surveillance system.